The Prince Albert Raiders are pleased to announce the signing of right winger Tyson Laventure to a WHL Standard Players Agreement. 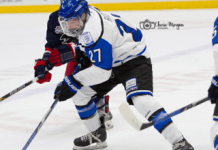 Laventure was selected 31st overall in the 2018 WHL Bantam Draft on May 3. The Lloydminster, AB product suited up in 30 games for OHA Edmonton Bantam Prep, scoring 25 goals and adding 19 assists. He also contributed two goals and five assists in five playoff games. Recently, Laventure was named to Team Alberta’s provincial camp for the 2019 Canada Winter Games. Laventure joins third-overall pick Nolan Allan as the first two members of the Raiders’ 2018 draft class to sign their players agreement.